"Similar to latkes but the waffle iron makes a lot more crunchy surface area and steams the potatoes perfectly. Serve immediately with your favorite hash brown toppings." Preheat waffle iron according to manufacturer's instructions. Spray waffle iron with cooking spray. Place shredded potatoes in a bowl. Pour enough cold water over potatoes to cover; soak for 2 to 3 minutes. Drain and rinse to remove starch. Squeeze water out of potatoes by hand or by rolling in a clean kitchen towel and twisting towel to wring out water. Toss potatoes with oil, garlic, salt, pepper, and paprika in a bowl until evenly coated. Stir eggs into potato mixture. Spoon half the potato mixture into preheated waffle iron; cook until potatoes are tender and golden brown, 5 to 8 minutes. Repeat with remaining potato mixture. 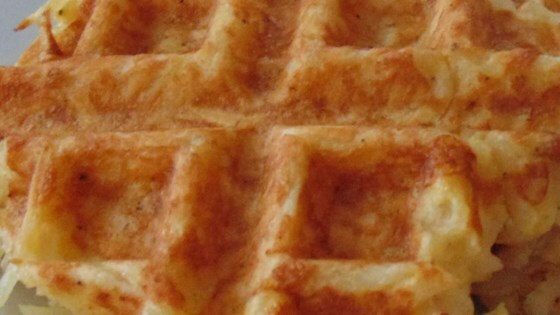 This recipe is sized for a large Belgian waffle maker but can be made with any kind of waffle maker. This produces a lot of steam so I usually set up the iron on my stove and turn on the vent fan. Fresh or frozen packaged potato shreds can be substituted, skip step 2. Diced onions, peppers, ham, or other veggies and meats can be added but cheese tends to burn before the potatoes are cooked. Creative! I liked the addition of smoked paprika and garlic for some extra flavor. This makes for a great breakfast sandwich also. Just use in place of toast.